The automotive world has gone completely gaga for crossovers, which is completely understandable considering their smooth rides, high fuel efficiency, and versatile utility, but that doesn’t mean that every single SUV in the industry has to be a crossover, despite the current trends. In fact, here at Toyota of Newnan, the Toyota 4Runner long has been one of our favorite models, and the 2018 model year version of the vehicle obviously is the best one yet. As a traditional SUV, the 2018 Toyota 4Runner offers the body-on-frame construction of a more rugged brand of sport utility vehicle. Not many are built like this anymore, so to have one available to Toyota customers must be a nice breath of fresh air for those who appreciate an SUV that can do some damage off-road. With high ground clearance and tons of built-in off-road hardware, it can tackle a number of different terrains, making it an ideal vehicle for those Fayetteville, GA drivers that love the great outdoors. It also has an available third row for those that need a little extra seating, and the trim levels give potential customers a number of different options for purchasing. They all have the same engine, however, which is a 4.0-liter V6 capable of generating upwards of 270 horsepower and 278 lb-ft of torque. This Toyota SUV can tow up to 5,000 pounds and is available in rear-wheel drive and all-wheel drive configurations. Because this vehicle is so capable off-road, it must come loaded with plenty of safety features that are appropriate for rougher driving. For example, the 2018 Toyota 4Runner comes standard equipped with the Star Safety System™, which includes vehicle stability control, traction control, electronic brake-force distribution, brake assist, and smart stop technology. As far special features are concerned, the Entune™ infotainment system is logical and easy-to-use, thanks to its touchscreen control panel. Depending on the model and the optional features a customer chooses, this system gives drivers access to Bluetooth® and phone connectivity, voice commands, and navigation with real-time weather and real-time traffic. 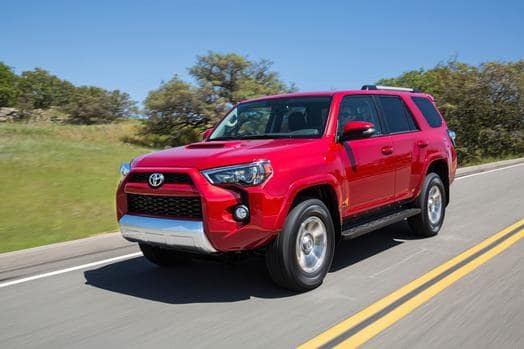 If you would like to check out any of our new or pre-owned Toyota models, including the 2018 Toyota 4Runner, come pay us a visit here at our car dealership in Newnan, GA any time and we will be happy to get you behind the wheel for a test drive in a terrific, rugged Toyota SUV or an innovative sedan like the Toyota Camry.